Amazon - Amazon.com is a global website where thousands of merchants sell products through Amazon.com, Amazon Marketplace, and their many subsidiary businesses. In addition, there are sister sites in Canada, China, France, Germany, Japan, and the UK. ​Alibris - Books online - new, rare, and used books, movies and music for sale. Best Buy - Shop for Electronics and Technology from Best Buy Online. Compare computers, cameras, and TV prices from the comfort of your own home. Compare Prices with these sites! Coupon Sites - Looking for online coupons? Craigslist - Craigslist is a centralized network of online communities, featuring free online classified advertisements – with sections devoted to jobs, housing, personals, for sale, services, community, gigs, resumes, and discussion forums. Etsy - Seeking original oil paintings? Or perhaps you’re wishing for artful or handmade goods? Basically a more crafty classifieds website, Etsy allows you to shop for just such gems. Find everything from personalized guitar picks to mermaid costumes. Also it is very easy to get involved on Etsy if you are interested in becoming a seller. 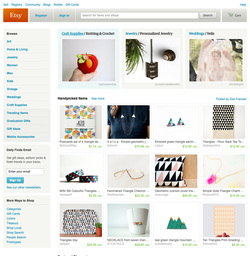 It is easy to sell on Etsy and they offer a variety of options for sellers such as; low fees, powerful tools, and support and education for anyone looking to sell their goods. Google Shopping - With Google Shopping, buyers and sellers will find it easy to use and convenient for buying and selling needs. For buyers there is an easy to use menu to help you find exactly what you're looking to buy. Jane.com - online clothing boutique marketplace with the latest trends in women's fashion, children's clothing, home decor, and more. KSL Classifieds - These are online classified ads local to Utah. Many people use this to sell just about anything, and it is one of the premier ways of selling or buying a used car in Utah. ​OverStock.com - Overstock.com (NASDAQ: OSTK) is an online discount retailer based in Salt Lake City, Utah that sells a broad range of products including furniture, rugs, bedding, electronics, clothing, jewelry, and cars. A subsection of Overstock called Worldstock.com is a fair trade department dedicated to selling artisan-crafted products from around the world and offers additional unique items. ​TigerDirect - TigerDirect.com was established to serve the needs of computer users, and today we are one of the industry's top computer and computer-product retailers. Our web site has been ranked among the New York Times' "Top 25 Online Retailers" and our catalog has become a textbook for computer users. But our success has been built on a simple principle: take care of every customer like they were a member of our family. From the beginning, our top priority was to provide unmatched customer care and to help our customers understand how technology could help them. We've always invited intelligent, courteous men and women to staff our call center; to answer your questions, make recommendations and deliver solutions. We stock our web site with the latest products, the best deals---and plenty of information to help you decide for yourself. We are proud of each and every member of our staff, because they make the difference. WalMart - Shop online for anything you can buy at your local Walmart store and much more. Free delivery to the store nearest you. Walmart now has grocery pickup﻿﻿ where you just order fresh groceries online with free same-day pickup. They’ll even load your car. Wish - An online e-commerce company that sells items for low prices. Once you've done that, you'll be able to browse the available deals. You can browse by category (Accessories, Baby & Kids, Fashion, Gadgets, Hobbies, Home Decor, Phone Upgrades and more), and there's even a Made for You Section that includes T-shirts and mugs customized with your name. If you browse the available products on Wish, you'll quickly note that it advertises some almost unbelievable discounts. For example, a pair of women's boots is listed as being marked down from $181 to $18. However, Wish doesn't list any brand information or other specifics for this product or for countless others on its site, so it's not possible to verify that you're really receiving such a huge discount. Woot! - Woot! is a unique shopping website that offers a new deal every day. There are different categories that are offered including Home & Kitchen, Electronics, Computers, and Shirt. Each purchase is handled by Amazon and Amazon Prime members get free 2-day shipping! Zappos.com - Shop for men's, women's, and children's apparel online from the comfort of your own home. Zappos always offers free shipping & returns on any purchase for ease and convenience for their customers.